For some this is no brainer….every parents of teenagers intuitatively know this! But now scientific research is there to back it. This comes from European scientists and report appeared in the journal Translational Psychiatry. The researchers found that frequent gamers had changes in the reward center of the brain. The discovery might connect gaming to addictive behaviors like drug use and gambling. Read the news report in Los Angeles Times. and WebMD. Video and computer games have become a highly popular spare-time activity for children, adolescents and even some adults. 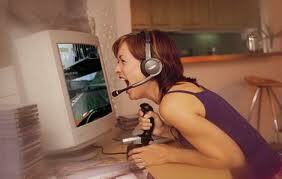 Some report favourable and adverse effects of frequent video game playing. Studies have demonstrated that video game playing can enhance visual skills related to attention and probabilistic inferences. Furthermore, improvements in higher cognitive executive functions such as task switching, working memory and reasoning have been associated with gaming improvements in older adults. Complex visual simulation are used in warfare training, piloting and even surgery today depends on gaming technologies. Kids who spend many hours everyday playing video games or computer games may be hardwired to behave that way; they may become impulsive and suffer from attention deficit. Studies find that their brains may have been altered as a result of all the gaming. Some argue that video gaming is addictive the way cigarettes, alcohol, and drugs are. Arguments are far from over. Studies will continue to emerge on either end of spectrum. In the meantime, moderation and parental supervision may be more essential than ever before. Keeping them off from such influences may be nearly impossible. Video games continues to get more violent and morally offensive. Long terms effects of such behaviors are difficutl to predict. Teens might not have moral framework to navigate thro quagmire and parents better be more involved.